Featuring a classic closed deck, our Evendale Court China Hutch is Amish handcrafted to provide your family a lifetime of china display and service. 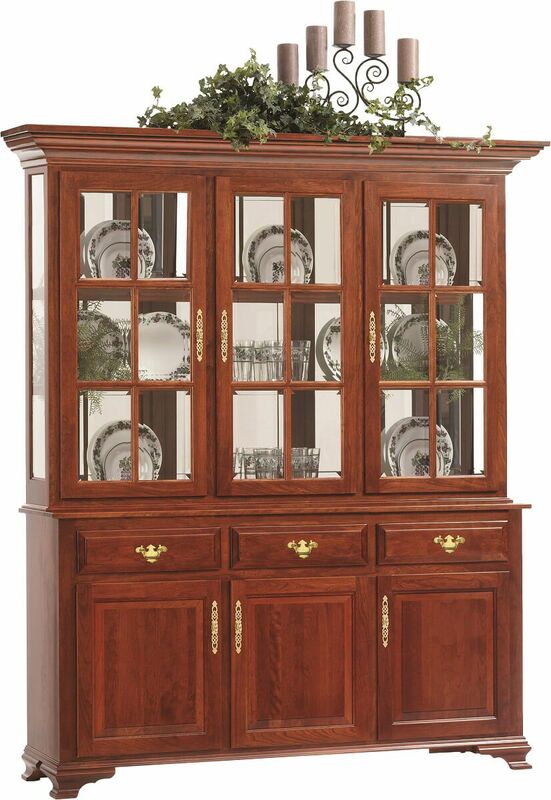 Formal Queen Anne style is created from solid wood in your Evendale Court China Hutch. An ornate crown moulding and raised panels combine with standard features such as a mirror back display, mullion glass display doors, and plate grooved shelves. A recessed lighting display is controlled with a tough system, which illuminates through the glass sides. The enclosed buffet, which offers plenty of dining room storage, is equipped with concealed door hinges and full extension drawers. Shown in Cherry with a Christmas Cloves finish, you may order this exquisite hardwood china cabinet in your preferred hardwood and stain combination. Make your selections from our online options menu and our Amish artisans will handcraft the wooden china display case you design.